Advancing the work of The Cancer Genome Atlas (TCGA), a large team of researchers from multiple institutions performed a comprehensive analysis of molecular data from thousands of patients representing 12 different types of cancer. The analysis pointed to an alternative system for classifying cancer. Instead of defining cancers according to their tissues of origin, the new system considers molecular subtypes. When the new system is used, as many as 1 in 10 cancers may be reclassified. In these instances, reclassification may be anything but academic. It may, for example, suggest that cancers from a particular tissue may comprise cancers of different subtypes, each with a different prognosis, each vulnerable, possibly, to different therapies. A new classification system for cancer could also affect drug development or the recruitment of patients into clinical trials. 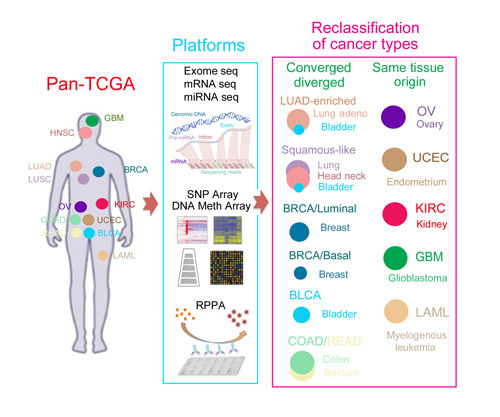 The new system was presented August 7 in the journal Cell, in an article entitled “Multiplatform Analysis of 12 Cancer Types Reveals Molecular Classification within and across Tissues of Origin.” This article described how tumors were characterized using six different platforms—mostly genomic platforms such as DNA and RNA sequencing, plus a protein expression analysis. These platforms generated findings that converged on the same set of 11 molecular subtypes, giving the researchers confidence that the subtypes were valid, as well as suggesting that different kinds of data could be used to classify a particular tumor. Of these 11 subtypes, five were nearly identical to their tissue-of-origin counterparts. Several distinct cancer types, however, were found to converge into common subtypes. For example, lung squamous, head and neck, and a subset of bladder cancers coalesced into one subtype typified by TP53 alterations, TP63 amplifications, and high expression of immune and proliferation pathway genes. A striking example of the genetic differences within a single tissue type is breast cancer. The breast, a highly complex organ with multiple types of cells, gives rise to multiple types of breast cancer: luminal A; luminal B; HER2-enriched; and basal-like, which was previously known. In this analysis, the basal-like breast cancers looked more like ovarian cancer and cancers of a squamous-cell type origin, a type of cell that composes the lower-layer of a tissue, rather than other cancers that arise in the breast. Study participants—which included researchers from the University of California, Santa Cruz, Buck Institute for Age Research, University of North Carolina Health Care, and University of California, San Francisco—relied on a method they called cluster-of-cluster assignments (COCA). The COCA subtypes, the researchers noted, could reflect tumors arising from distinct cell types.